Applied Diamond Tools DBA Toolocity > Vacuum Suction Cups > MINI Rachet Seam Setter 4-1/2"
MINI Rachet Seam Setter 4-1/2"
The MINI seam setter is a very functional seam joining tool and it's also simple. 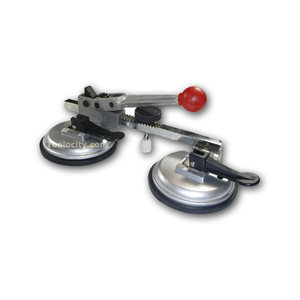 It features double 4 1/2" suction cups, manual puller/tighten handle, and center leveler. It's useful for the leveling and seam joining of tiles and granite counter tops. For the joining and seaming of granite counter tops, 2 of these seam setters will achieve the best result. Dimension is 12" x 4 1/2". Less than 4 lb.